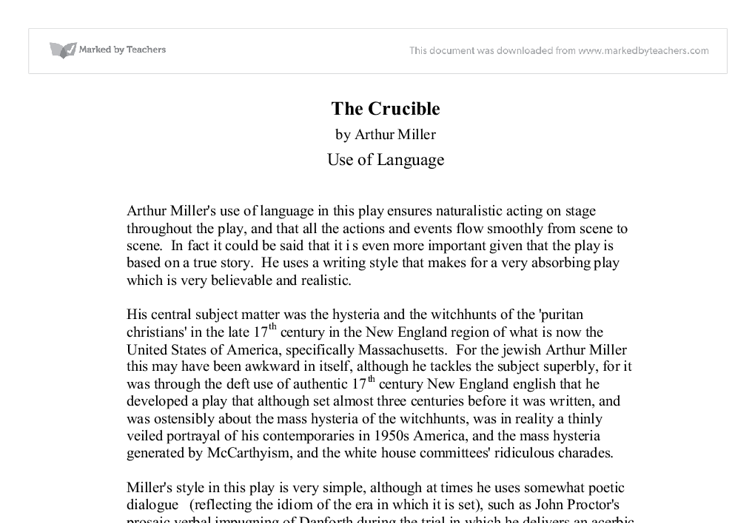 The Crucible by Arthur Miller Use of Language Arthur Miller's use of language in this play ensures naturalistic acting on stage throughout the play, and that all the actions and events flow smoothly from scene to scene. In fact it could be said that it is even more important given that the play is based on a true story. He uses a writing style that makes for a very absorbing play which is very believable and realistic. His central subject matter was the hysteria and the witchhunts of the 'puritan christians' in the late 17th century in the New England region of what is now the United States of America, specifically Massachusetts. For the jewish Arthur Miller this may have been awkward in itself, although he tackles the subject superbly, for it was through the deft use of authentic 17th century New England english that he developed a play that although set ...read more. For example he brings out the nefarious nature and treacherous disposition of Abigail and the other girls and also the gullibility of some of the judges, His style is easy to understand by the modern day reader and this is necessary in order to be successful as a contemporary play. While using the simple style, Miller does not take anything away from the suspense in the plot. The dialogues of his character are like actual speech, and are very naturalistic. His words are used expertly and do not include anything that is not necessary for making an exciting and enjoyable play. Many clever metaphorical, literary tools are employed, for example at one point in act one Abigail says that John "sweated like a stallion", (Abigail: "I know how you clutched my back behind your house and sweated like a stallion whenever I come near! ...read more. An example would be the use of the rather controversial term 'covenanted' - the modern form of which will be familiar to quite a few modern American readers as 'saved'. Other such fine examples abound, such as to 'break charity': to fall out of friendship, to 'plough on sunday': to break the fourth commandment, 'proof so immaculate': proof without any doubt, and so on. 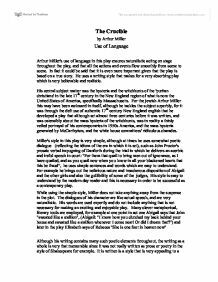 In summary then, Miller has produced a play that in spite of it's rather old fashioned setting translates to the modern day very well and possess still today very relevant and far-reaching themes about human nature. He achieves this through the use of characters who are not only very believable and convincing, but through language that is very lucid and convictive in spite of the seemingly antediluvian nature of the story and setting. ...read more. seem normal, but to a more modern audience of today it helps them to fully understand life just after the war, and family life of that era. At the end of act one, the audience are made aware of a new character, Anne's brother George. It will be a relief to see Ant depart. It mainly tricks the audience into wondering what will happen next. After they have been arrested the staging changes and we have minimal set two benches signifying a police cell in Wembley stadium. was reflected by his wife's final statement which we look at the end of act four: "He has his goodness now. God forbid I take it from him" It is understood that Miller's intent in this was to portray the innocence of those falsely accused in the McCarthy trials. she cannot bear to hear the Lord's name!" Act one Page 30 This shows how everything is revolving around religion and how they are strong believe of Sod and that without Sod they would be doomed as they believe they must do everything that's in the bible otherwise Sod will punish them for their sins. Creative writing - The Pedestrian. He condemns but makes money. I think who would be hold as responsible for this tragedy of a show would have to be the audience. It is the audience who became bloody thirsty and change sides. It is them who became jealous and tell the hired killers where Jim is hiding. When Norfolk says: "then your reasons must be treasonable!" More shows that he is slightly na�ve: "not must be, may be". Here More has put is life in the hands of the man's law; he doesn't understand that laws based on hierarchy can be broken by the person on the top of that hierarchy. When the curtains go up the room is empty. John Proctor enters with a gun and goes over to the fireplace and leans the gun by the wall and then goes over to a pot at the fireplace where Elizabeth the wife of john has put the stew to cook.